Description: Kerll's gloomy and imploring mass in thanks for the defeat of the Turks at Vienna in 1683 is noteworthy not only for its expressiveness but also for its exquisite double counterpoint and novel harmonies. 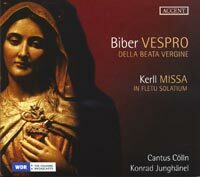 Biber's vespers motets, from a cycle of three sets published in 1693, are interwoven with motets by Kerll (1669) to produce a complete Marian Vespers. Cantus Cölln, Concerto Palatino; Konrad Junghänel.